While I do believe there are six or seven tackles who can play within their first couple years in the league, the rest of the group features developmental guys who need some work. 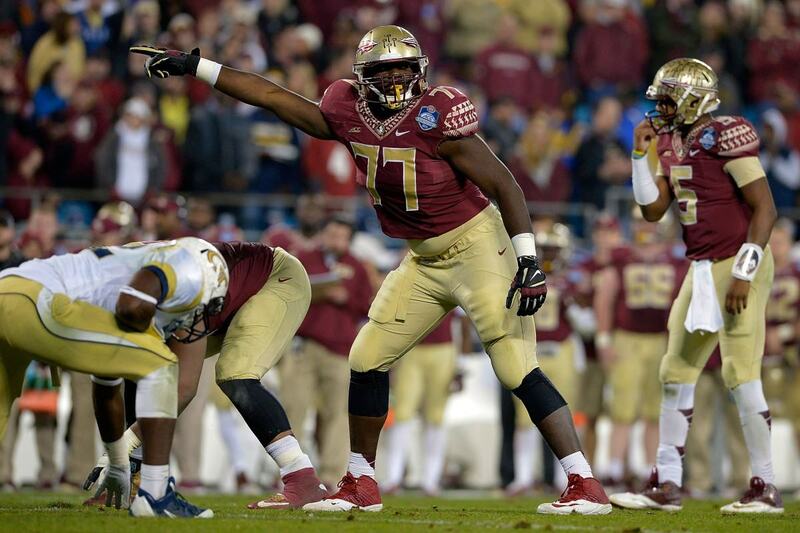 Florida State offensive tackle Roderick Johnson is one of those developmental players. At 6’7 300 pounds, Johnson absolutely looks the part of an NFL left tackle. However, his struggles in pass protection and his overall inconsistency make him a day three prospect to me. Johnson is at his best on gap-scheme type plays where he is asked to down or drive block. A powerful run blocker with good athleticism, Johnson flashes the ability to move defensive linemen off the ball as well as the ability to get to the second level and cut off linebackers. Against Florida here, Johnson does a good job of coming off the ball with low pad level, and striking the three technique back inside of the guard. This not only makes the guard’s job easier, but also allows Johnson a free path to the second level. Once he gets to that second level, Johnson is able to break down and get his hands on the linebacker, sealing the backside of the play and opening up a nice hole for Dalvin Cook. While Johnson excels in these blocking schemes, he struggles mightily in others. If asked to zone block, I don’t believe Johnson has the footwork or patience to work his way through those blocking “progressions.” Roderick Johnson does have good athletic ability and is powerful laterally, but his hand work leaves much to be desired. In pass protection is where we see Johnson’s greatest struggles, however. Often impatient in his pass set, Johnson tends to over-extend or lean forward too much, leaving him susceptible to being beat by defensive ends with both speed and power moves. Overall, his pass blocking technique must be improved if he is going to be successful at all in the NFL. Against Ole Miss here we see more of Johnson’s pass blocking problems. His feet die on contact, his hands don’t deliver any type of real punch, and his balance issues are on full display. He is also a waist bender in pass protection, which must be fixed. Johnson also tends to get beat with inside-counter moves, which is indicative of both his weak footwork and lack of functional strength in pass protection. He must learn to power-down better in order to stop these inside moves. At this point, Roderick Johnson is a developmental tackle, and a right tackle at that. While he has the frame and size to look the part of an NFL left tackle, he just isn’t refined or skilled enough in his technique to warrant a day two pick. I have a fourth round grade on Johnson as of now, and expect him to possibly get over-drafted due to his size, run blocking, and perceived potential.